In the first nine months of 2017, international freight forwarding and logistics company Panalpina grew volumes in both Air and Ocean Freight compared to the same period of last year. As the year progressed, group gross profit as well as EBIT increased with every quarter. Year-on-year, Panalpina’s reported EBIT increased from CHF 67.5 million (adjusted YTD 2016: CHF 93.6 million) to CHF 72.1 million and the reported consolidated profit increased from CHF 46.5 million (adjusted YTD 2016: CHF 72.6 million) to CHF 48.4 million. Group gross profit decreased 6% to CHF 1,024.8 million in the first nine months of 2017 (YTD 2016: CHF 1,091.7 million), while total operating expenses decreased 4% to CHF 920.9 million (YTD 2016: CHF 961.0 million). 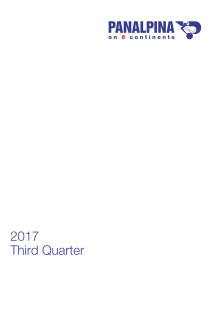 Reported EBIT and consolidated profit increased year-on-year (decreased when compared to respective 2016 adjusted figures). 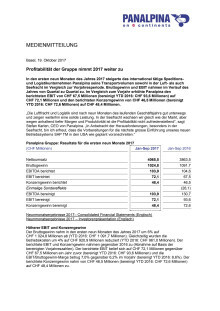 Reported EBIT reached CHF 72.1 million compared to CHF 67.5 million a year before (adjusted YTD 2016: CHF 93.6 million) and the EBIT-to-gross- profit margin stood at 7.0% up from 6.2% (adjusted YTD 2016: 8.6%). The consolidated profit increased from CHF 46.5 million (adjusted YTD 2016: CHF 72.6 million) to CHF 48.4 million. Panalpina’s Air Freight volumes increased 8% in the first nine months of 2017, broadly in line with market growth. From January to September, gross profit, unit profitability and EBIT in Air Freight increased with every quarter. Compared to the same period of last year, gross profit per ton decreased 7% to CHF 632 (YTD 2016: CHF 678), resulting in a gross profit of CHF 456.0 million (YTD 2016: CHF 453.4 million). Reported EBIT in Air Freight increased from CHF 60.0 million (adjusted YTD 2016: CHF 72.6 million) to CHF 69.4 million. The EBIT-to-gross-profit margin for the first nine months of 2017 came in at 15.2% compared to 13.2% (adjusted YTD 2016: 16.0%) a year before. CHF 345.0 million). Higher volumes than last year were processed at lower margin and with increased costs which resulted in an EBIT loss in the third quarter. For the first nine months, Ocean Freight posted an EBIT loss of CHF 5.5 million, down from a profit of CHF 6.3 million in 2016 (adjusted YTD 2016: CHF 16.0 million). CHF 293.3 million), but has stabilized throughout 2017. 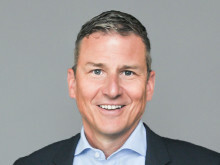 Logistics is now sustainably profitable, posting an EBIT of CHF 8.1 million for the first nine months of 2017, compared to CHF 1.2 million (adjusted YTD 2016: CHF 5.0 million) for the same period last year.